Regardless of industry, employee engagement is critical for success. Reduced staff turnover, improved productivity and efficiency, greater customer retention rates, increased profits and happier employees are all results of positive engagement strategies. 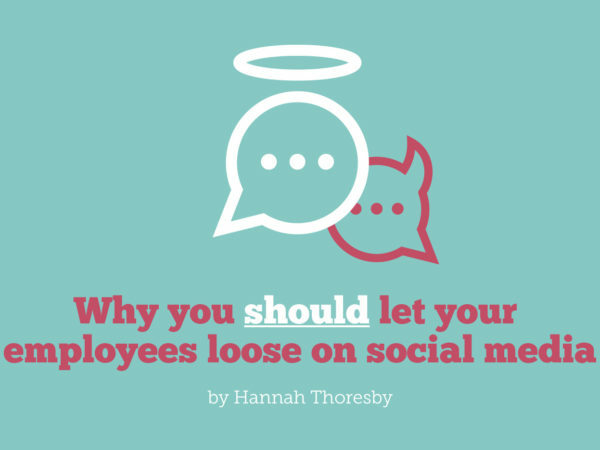 For those reasons, among others, implementing best practices for engaging employees is vital. Whether you’re looking to monitor already-enthused employees or kick off some new initiatives to improve motivation and productivity, technology-fueled mechanisms and applications to assist in these endeavors are available to businesses of all sizes. To help you determine the methods that are best suited to your team, I’ll be breaking down the top five ways technology can aid you in your engagement efforts. Collaboration is a loaded word in the business world. As one of the most important aspects of a successful company, encouraging collaboration is essential. In fact, a Nielsen report found that when ideas were developed by groups of three or more, they had 156% greater appeal to consumers than those developed by just one or two employees. 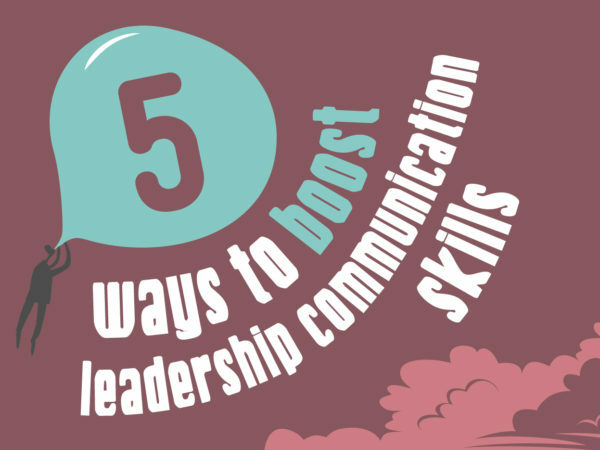 Optimizing collaboration among employees can be carried out in various ways, which all begin with improving communication. 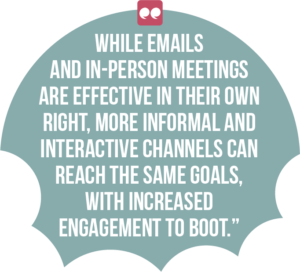 While emails and in-person meetings are effective in their own right, more informal and interactive channels can reach the same goals, with increased engagement to boot. Google Hangouts, Slack and Workplace by Facebook for example are easily implemented and highly effective messaging applications designed for office communication. These messenger apps provide a great way to communicate with individuals or teams of employees at once and offer a platform for people to easily respond or share their feedback. 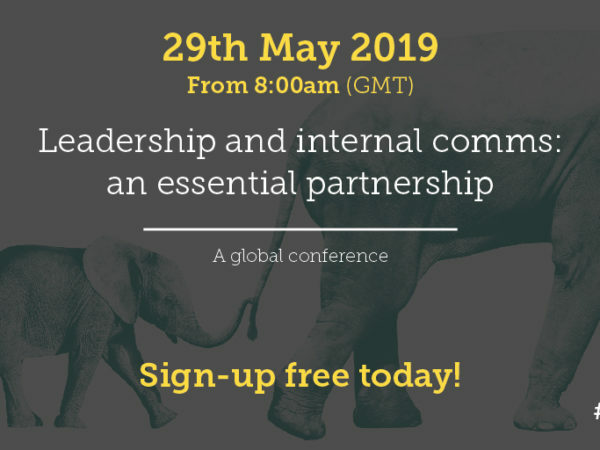 Remote employees in particular can benefit from the engaging qualities of messenger apps, as they enable them to easily get in touch with coworkers and feel more integrated into conversations happening across the organisation. Moreover, chat apps can also be utilized for employee bonding. HomeHero, for example, uses Slack for company-wide trivia. Every Friday at 4pm, employees are given a trivia question via Slack and everyone chimes in with their answers in the team thread. Simple additions like this invite more collaboration, and add a bit of fun to the workplace. While this is true, people are also generally more motivated and productive when they’re happy, making increasing productivity a matter of improving company culture as well. Using gamification technology is a great way to engage employees while also boosting productivity. The idea behind this popular trend is that implementing friendly competition in the workplace can serve as an entertaining and engaging motivator. Rather than traditionally tedious processes of tracking productivity levels, leaderboards, badges and other game-centric measurements are used instead. Many organisations have seen a number of benefits through the implementation of gamification software. 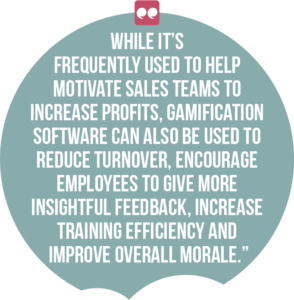 While it’s frequently used to help motivate sales teams to increase profits, gamification software can also be used to reduce turnover, encourage employees to give more insightful feedback, increase training efficiency and improve overall morale. Salesforce Motivation, for example, replaces manual processes with a user-friendly sales application that displays a team leaderboard, a progress bar and a customizable featured challenge. The leaderboard highlights which teams are in the lead with the most points, while the ‘Rewards’ tab offers employee-selected prizes. While this all serves as a motivator, Salesforce Chatter fuels engagement by allowing teams to easily communicate and collaborate. Workplace meetings generally get a bad rap for either being too long, too boring or wholly unnecessary. Regardless, they’re nonetheless often a necessity in most organisations and should therefore be optimized for success. Interactive tools can be a great addition to help make meetings more enjoyable and captivating for employees. 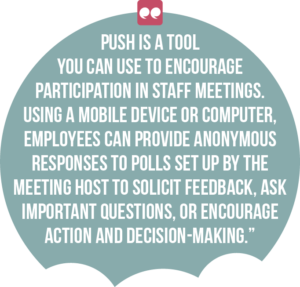 Push is a tool you can use to encourage participation in staff meetings. Using a mobile device or computer, employees can provide anonymous responses to polls set up by the meeting host to solicit feedback, ask important questions, or encourage action and decision-making. With customizable multiple-choice poll questions and answers and the ability to add your brand colours and logo to your polls, facilitators can more accurately gauge the thoughts, opinions and feelings of the group. Responses are displayed in real-time and the data is displayed in visual format so you can quickly assess it at a glance. These sorts of interactive tools help to make for a more inclusive environment in meetings, especially for team members who may be quiet or who may not feel comfortable speaking up. Push can help you get the answers you need at the push of a button. Create customisable polls in minutes, see responses in real-time, and make speedy, informed decisions so you can keep your life moving. People like to be told when they’re doing a good job. One of the simplest and most effective ways to drive engagement is to recognize employee achievements. Depending on your company environment, various employee recognition tools are available to help you thank and recognise employees. Gamification features can also be found in these processes, which again encourage employees to use the tools more frequently. 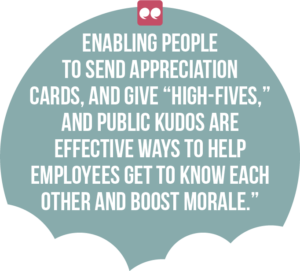 Enabling people to send appreciation cards, and give “high-fives,” and public kudos are effective ways to help employees get to know each other and boost morale. As technology allows us to outsource more positions, remote employees are becoming increasingly more commonplace. While these employees may not be physically present in the office, it’s important to keep them feeling like a part of the team and actively involved in all inter-office communications and activities. This is a crucial mindset to maintain when considering your remote employees. Video-conferencing is essential for including remote workers in office meetings. 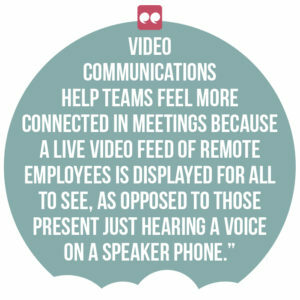 Video communications help teams feel more connected due to the fact that a live video feed of remote employees is displayed for all to see, as opposed to those present just hearing a voice on a speaker phone. Applications like PukkaTeam are designed to keep remote employees in the loop and prevent communication misunderstandings that often develop from emails and texts. With a camera running throughout the day showing updates and a still image of each team member, you can quickly initiate conversations just as you would in an office. According to Dale Carnegie, companies with engaged employees outperform their non-engaged counterparts by 202% . With technology on your side, it’s easier than ever to remind your team of the value they provide and increase motivation across every branch of your business. 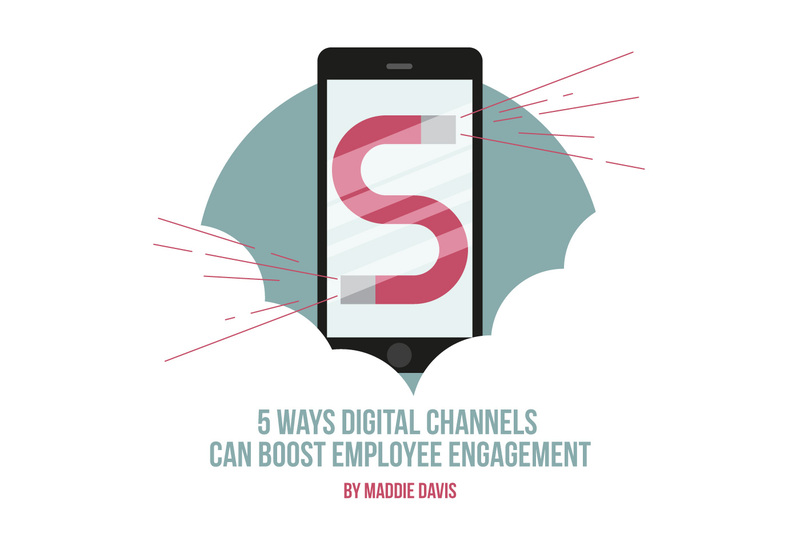 I hope these digital-channel ideas inspire you to improve engagement levels in your organisation, and to reap the benefits of a happier and more productive workforce. 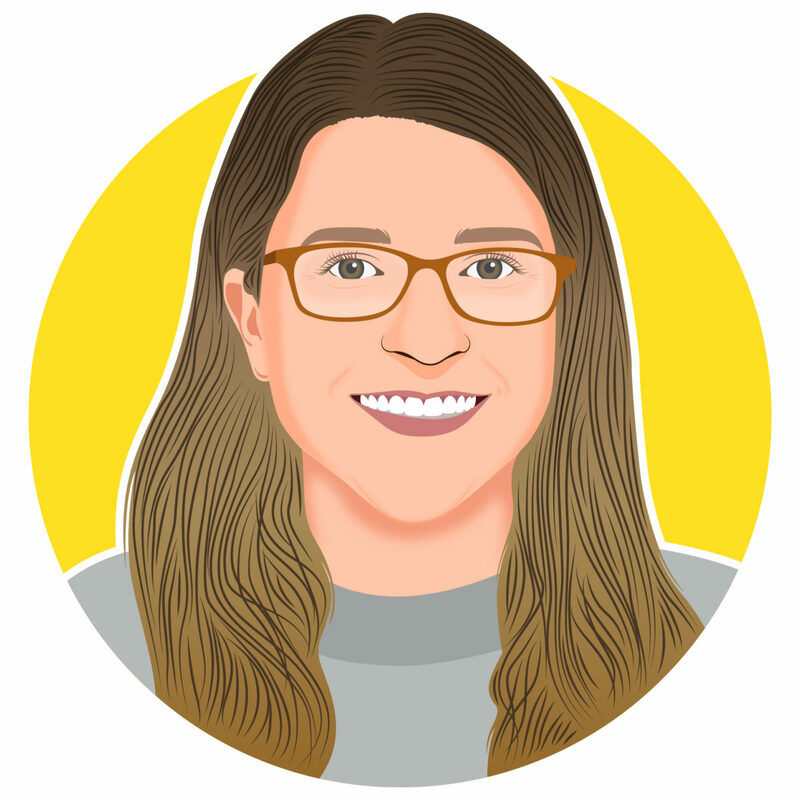 I’m co-founder of Enlightened Digital and a tech-obsessed writer based in the Big Apple. I build and design great websites, and in my spare time you can find me running marathons and reading anything and everything on the NYT Best Sellers list. Check out Enlightened Digital on the web and follow us on Twitter and Facebook! 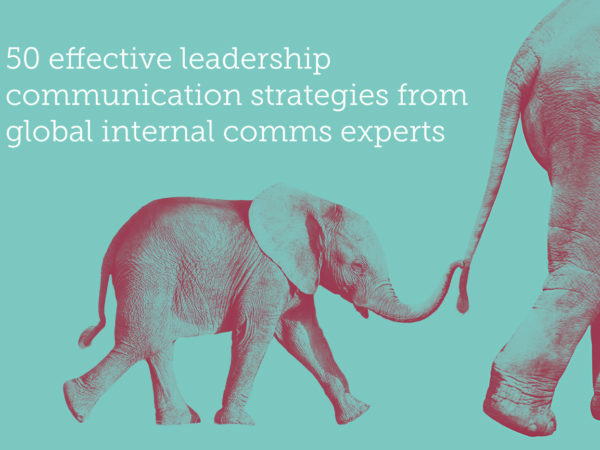 In today’s interconnected world, you can’t afford to keep your internal comms channels stuck in the Dark Ages. Our crack team of digital designers, animators and developers can serve all your digital internal comms needs – from creating powerful visuals that grab people’s attention, to crafting engaging animations that convey important information in an impactful way, and building custom full-service communications management systems that will get your employees buzzing. Talk to us today to find out what we can do for you!